The Alive Casino platform is now Live. The Alive Casino is the world’s first cryptocurrency casino to offer a virtual reality gambling experience. Place your bets and WIN! 40% of Alive Casino profits will be distributed to token holders who have their tokens located in the Alive’s Hold Wallet. Receive BTC, ETH, USDT and AL every 3 months! As a rule, every three months, Alive’s in-house token engineers will burn 5% of all AL tokens the house earns each quarter reducing the token supply and creating a higher demand for the token. Alive Tokens will be useful to access exclusive token holder only features, such as early-release of virtual reality games and special events. Among the Alive token’s key functions is, of course, payment. During the early stages of the platform’s operations, Alive token holders will be able to deposit tokens, along with other cryptocurrencies and fiat, in order to begin playing.  The online gambling market size has increased from 20.51 billion U.S. dollars to 51.96 billion U.S. dollars in the past decade.  It is expected to increase up to 81.71 billion U.S. dollars by 2022 which is over a 10% compound annual growth rate. Considering the development of new technologies that can be applied to this industry, one can argue that the potential is truly unrealized. Augmented (AR) and virtual reality (VR) market size is projected to increase from 27 billion U.S dollars to 209.2 billion U.S. dollars by 2022. The mass adoption of this technology will consequently make its products more affordable and accessible for consumers.  As an example, the price of an HTC Vive VR Headset has already decreased from $799 to $599 in the past year. The online gambling market shows a huge potential for an online casino to take “the first mover advantage” by integrating two of the fastest adopting technologies. The combination of blockchain technology providing fast, secure and transparent transactions, with the new experiences that virtual reality is bringing to the world, one must believe that the future of gambling is Alive. “First mover advantage matters a lot. 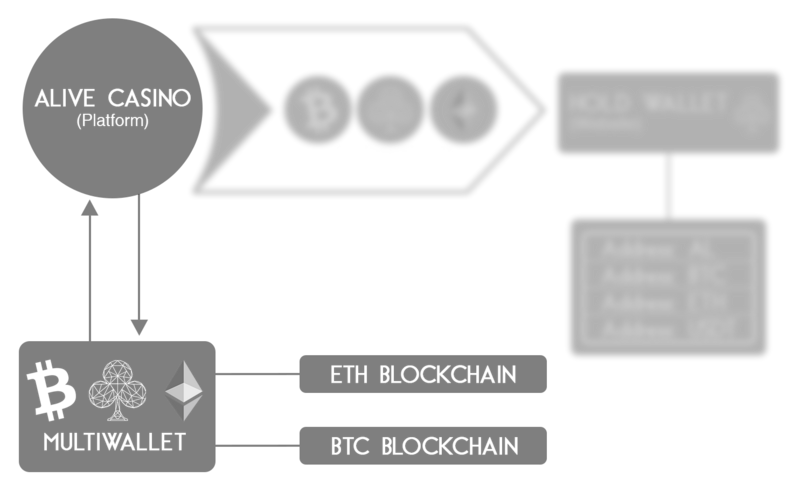 Just like bitcoin was the first cryptocurrency, the Alive Casino is going to be the first online casino to integrate two of the fastest growing technologies”. - Pablo Gerboles, CEO of Alive Entertainment LLC. 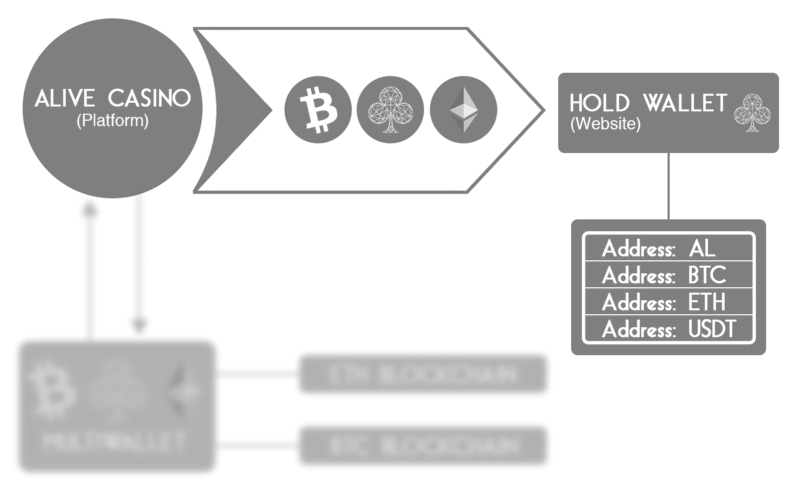 The Alive Casino is the world’s first cryptocurrency casino to integrate VR technology. In addition to our wide range of traditional online gambling options, Alive players can enjoy live games in both HD video and in VR. Don’t have a VR headset yet? Don’t worry! You’ll be able to win one at Alive. With the cooperation of our partner BetConstruct, we are planning to build our own Live Games Studio. Alive will benefit not only from having its own dealers but also from cutting the costs of using a third party provider, distributing to the Alive Token holders larger profits in the short and the long-term. Alive will give the opportunity to visit a land-based casino without leaving one’s home. Once the VR Casino is set and launched, the player gets a 360-degree view of fully interactive slots and live dealer tables. The VR technologies allow players to spin reels, engage with the live dealer, and play other VR games. The most complete Sportsbook software out there, with over 30.000 live matches every month. Non-stop action. Virtual sports are created using advanced technology that include innovative graphics and features. It is a new way of approaching entertainment and online betting. The world famous game that combines gambling, strategy and skill. Available for all levels - from beginners to pros. Players can find opponents from across the world to compete against in a variety of games where it is the ability of the players rather than the roll of the dice that determines who comes out on top. All the games offered have innovative designs, powerful graphic engines, and intuitive navigation. There will be hundreds of games available to choose from. OGWIL stands for Online Guaranteed Win Instant Lottery and combines the global and well-established appeal of scratch lottery cards with a highly immersive online game of chance. It combines casino games and betting. The games offered include Bet on Poker, Bet on Blackjack, Card Horse Racing and Keno. R Available online and on your mobile device. Participants will be able to compete against each other by building a team of professional athletes from a particular league or competition. Contenders will earn points based on the actual statistical performance of the players in real world competitions. Our live casino will have classic casino games and new generation hybrid games, including Blackjack, Roulette,Baccarat, Bet on Poker, Russian Poker, Zodiac Fortune. The Blockchain avoids the use of intermediaries for pay outs, allowing players to receive their earnings quicker. All cryptocurrencies are safe from malicius attacks by using HSM technology and cryptography. Transactions will be carried out under the supervision of smart contracts, providing transparency to the user. 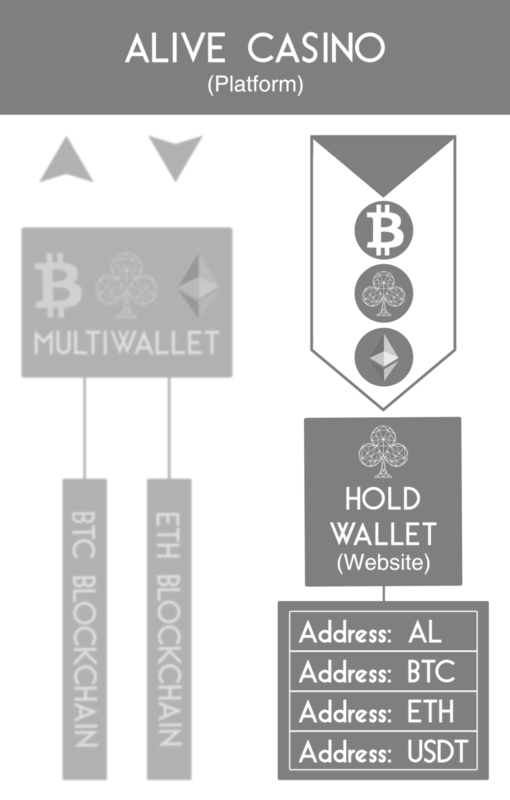 The Alive Casino development team will be implementing a multi-wallet system into the platform, in order to enable gambling in multiple currencies through the Blockchain. 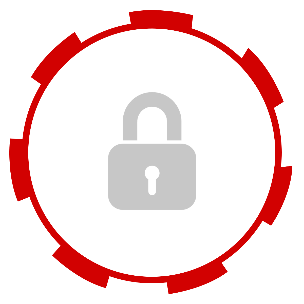 R Allows the storage of the cryptocurrencies accepted as a payment in the Alive Casino. R User accounts will be linked directly to the multi wallet, enabling quick and easy access to their funds and processing payouts through the blockchain. The Hold Wallet will be a web wallet system, accessible from the project’s website. Token holders must keep their Alive tokens in the Hold Wallet in order to receive benefits from the quarterly profit distribution. BTC, ETH, USDT and AL Tokens will be distributed. R Safe and secure way to store the Alive Tokens and receive profits quarterly. R The Hold Wallet will provide token holders the option to enter in BTC, ETH, and USDT addresses to where they wish to receive their quarterly profits. Apart from the VR Games available from the initial launch of the platform, a whole set of new VR games will be progressively developed and released on our platform. R In the VR Games testing period, users will have the chance to earn free tokens for participating and providing feedback. R The Virtual Reality Games released will be unique in the market and only available in the Alive Casino platform. R The VR Games will only accept AL Tokens, this will create a higher volume and demand of the token. To unlock your referral link and enjoy your bonus rewards, there is a minimum purchase requirement of 0.1 ETH. Alive token rewards will be automatically updated in your wallet after referrals have successfully purchased AL tokens. There are no limits as to how many members you can refer. The more you refer, the more tokens you will earn! 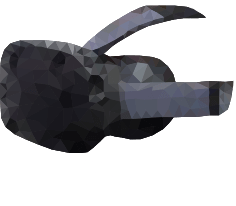 The member with the highest number of referrals wins an HTC VIVE VR HEADSET. The top 3 sponsors whose direct referral group has the highest accumulated sales figures will get additional AL Tokens. There is a minimum token purchase of 0.1 ETH required to unlock your referral bonus reward. Total group sales should not fall below 20 ETH to be declared a winner. Top performance referral rewards will be sent to the winners after the ICO, however, they will be locked for one year to avoid dumping. 700 Mn Alive Tokens are released to the public during the token sales. 100 Mn Alive Tokens are reserved for the founding team, locked for a 12 month period. 50 Mn Alive Tokens are reserved for future R&D. 30 Mn Alive Tokens are reserved for legal advisors, marketing services and partnership negotiations. 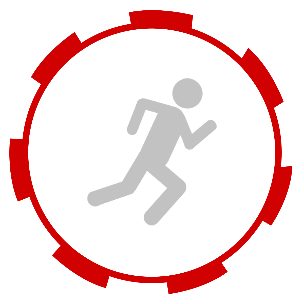 40 Mn Alive Tokens are reserved to grow the casino user-base. Bonus campaigns, poker tournaments, special jackpots and more. 20 Mn Alive Tokens are reserved for Bounty, Airdrops and other future marketing initiatives. Product and Technology Development as per roadmap. Budget for the Marketing of the platform & user acquisition. Costs for research and development of new VR Games, Blockchain, Payment Systems, etc. The cost of new licenses, strategic partnerships, collaborations & tie-ups. The cost of growing our team and retaining current team members. The cost of the whole ICO process, including audits, contracts, advertisement and more. require(balances[_from] >= _value);        //Enough ? //Define interface for releasing the token transfer after a successful crowdsale. BetConstruct is an award-winning developer and provider of online and land-based gaming solutions with development, sales and service centers in 16 countries. All partners benefit from the BetConstruct Spring platform with its powerful back office tools and all-inclusive services that empower operators growth and help contain their costs. Coindatadesktop is a website designed and created by the Alive Casino's development team. A fresh new platform full of data for tracking cryptocurrencies, upcoming ICOs and daily news about the market. It has very unique features with the purpose to provide investors and traders all the information they need in one place. It is also completely free to register. CoinMercenary helps stakeholders confirm the logic, quality and security of their Ethereum smart contracts using a comprehensive and standardized audit process. The audits combine compliance, security, a comprehensive checklist of known pitfalls and attack vectors, Solidity design patterns and best practices. THE FIRST DECENTRALIZED ONLINE CASINO TO OFFER A VIRTUAL REALITY EXPERIENCE. 3 What is the Alive Casino? 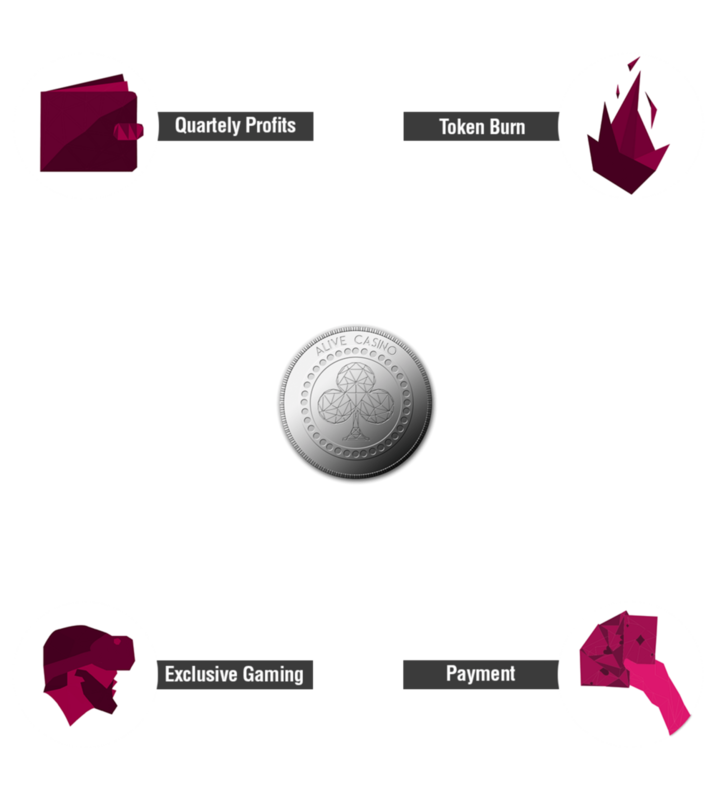 The Alive Casino operates as a decentralized online casino platform. It prides itself as being the first decentralized online casino to offer a virtual reality gambling experience. 3 How is the Alive Casino better than its competitors? The Alive Casino is set to disrupt the online casino industry by integrating two of the most high-potential technologies of the century; Blockchain and virtual reality. The development of new virtual reality games only available in the Alive Casino will bring a whole new experience to online gambling enthusiasts. VR skill games will give players the chance to test their skills against other players around the world, while immersing themselves in a 3D virtual environment. 3 What games will be initially available? From the very beginning there will be a whole set of traditional games available to play, including live dealer games, sportsbook, poker, casino suite, skill games, fantasy sports, virtual sports, OGWIL and virtual games. 3 Which methods of payment will be accepted at the Alive Casino? Initially, the platform will accept fiat currency and the Alive Token. The next cryptocurrencies to be integrated will be Ether and Bitcoin. 3 Which VR devices will be compatible with the gaming platform? HTC Vive and Oculus Rift will both be compatible with the Alive Casino’s virtual reality games. 3 Which wallets can I use to receive AL tokens during the token sale? MetaMask and MyEtherWallet are the only wallets that will be able to receive your AL tokens. Using an exchange wallet address will lead to the loss of your contribution. In addition, contributors must be whitelisted in order to participate in the token sale. 3 Which cryptocurrencies will be accepted during the token sale? Ethereum will be the only cryptocurrency accepted to contribute in the Token Sale. 3 Who can participate in the HTC Vive Headset Lucky Draw during the Exclusive Private Sale? Investors that contribute 50 ETH or more in the Exclusive Private Sale will directly receive a Free VR Headset. However, there will be a lucky draw between all contributors to give everyone the chance to win a VR Headset. The amount of Headsets available in the lucky draw will be 1 per 75 ETH raised during the Exclusive Private Sale. 3 What is the minimum amount required to contribute to the token sale? The minimum amount of purchase required to participate in the Private Sale will be 10 ETH. In all of the other Token Sale Stages there will be no minimum. 3 Why should I invest? The Alive Casino is projected to gain high amounts of revenue from the casino’s gambling services. 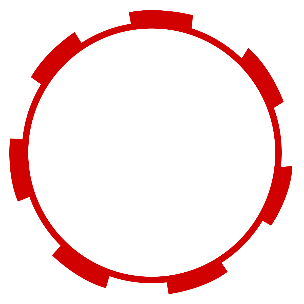 40 % of casino revenue will be distributed quarterly between token holders. The Alive token will also give exclusive access to different events and newly developed VR games, only available at the Alive Casino. 3 How do token holders receive their quarterly profits? 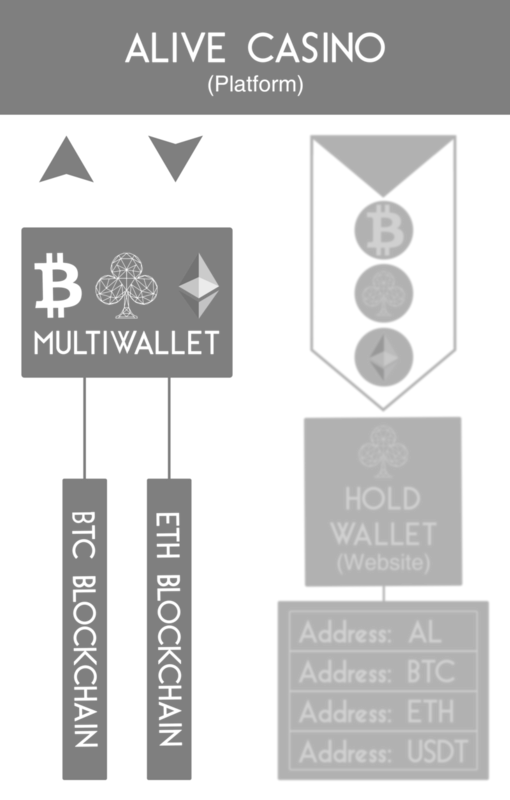 In order to earn profits, token holders must have their tokens on “Hold Mode,” meaning stored in the “Hold” wallet. Profits will be distributed in ETH, BTC and AL Tokens and exceptionally USDT. 3 What is the initial token price? The initial token price will be the equivalent to $0.015 during the Exclusive Private Sale. The token price will increase to $0.02, $0.04 and $0.09 in the following token sale stages.